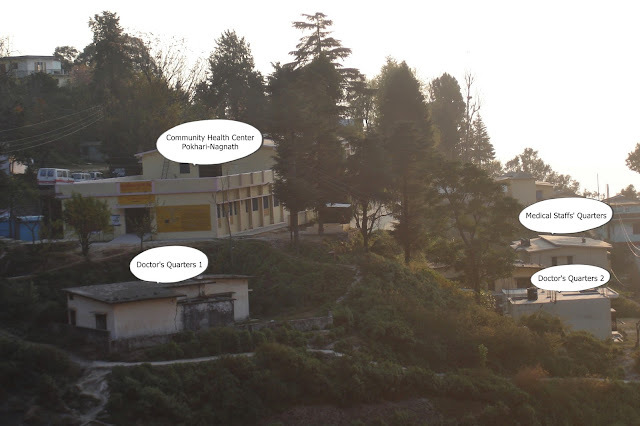 What you can see is the area where the government hospital at Pokhari-Nagnath is situated. It's quite outside the small town of Pokhari. This area is on top of a hill over-looking the other hills nearby. It is managed by ! doctor (Dr. Madan Bonal), 2 GNM, 2 pharmacists, 1 Ayurvedic pharmacist, 1 optometrist, 1 Lab Technician and other hospital staffs. Pokhari CHC is in Chamoli District, 28 kms. from Karnaprayag and around 64 kms. from Gopeshwar. Doctor's Quarters 1 needs total repair!